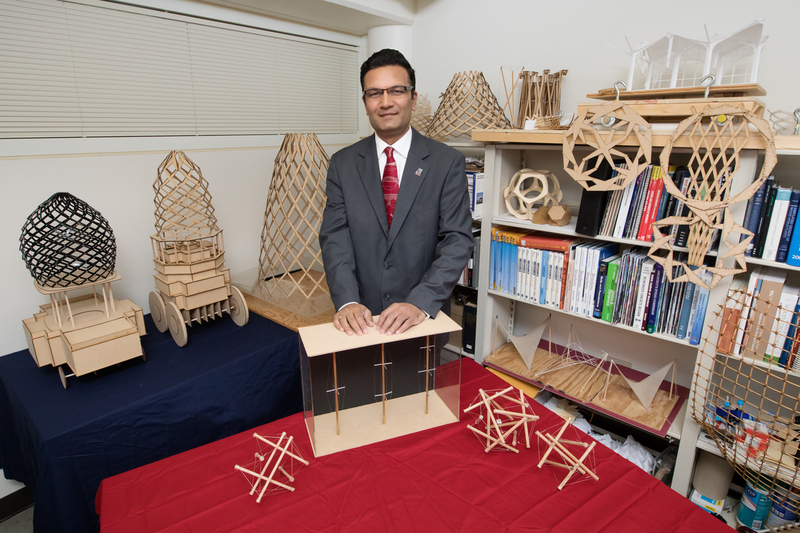 CHAMPAIGN, Ill. — Sudarshan Krishnan designs structures that can expand and collapse like an umbrella. His work is architecture made interactive – not a static building but a structural framework that moves and changes shape. 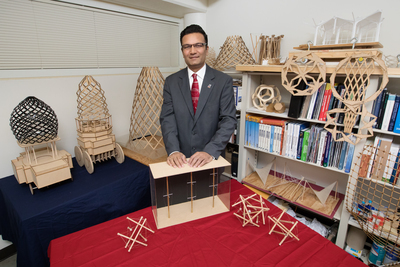 Krishnan teaches structural design and engineering courses at the University of Illinois School of Architecture, and his research is in the design of lightweight and transformable structures. These models of domes designed by Sudarshan Krishnan can expand and collapse. Krishnan envisions buildings that respond to user activities or to environmental conditions. He sees potential uses that include emergency shelters that could be easily transported and erected in areas struck by a natural disaster; antenna arrays that can be folded for transport in a rocket and then expanded for use in outer space; and domes for temple cars – large mobile temples used in religious processions in India. He is seeking to design buildings using minimal structure and lightweight materials. The space industry was a pioneer in pursuing lightweight construction materials and systems, Krishnan said, and remains interested in finding more reliable and robust versions. He’s presenting his research on the design of lightweight deployable antennas this week at the Earth and Space Conference of the American Society of Civil Engineers, an event that includes a number of NASA officials. 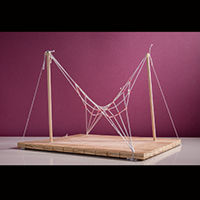 This model illustrates the use of prestressed cables and struts to support a larger load while reducing the size of the columns. The benefits of transformable structures include ease of transportation and storage when they are folded, the ability to reuse them and the ability to change the configuration of the structure depending on the needs of the user. For example, an emergency shelter with reconfigurable walls could allow a change in the size and arrangement of rooms, depending on how many individuals or families it was housing. Krishnan received the Arnold O. Beckman Award from the Campus Research Board last fall for a project working with a graduate student on designing emergency shelters for rapid deployment. He said such a structure could be used for emergency housing, mobile clinics or other uses, along with space-saving furniture that could be folded and stowed. One of the requirements of such a structure is that it needs to be assembled with ease by a few people. Krishnan is also collaborating with Trudy Kriven, a professor of materials science and engineering who is working with geopolymers – a lightweight material with superior properties that could be used in rapid assembly fire-resistant shelters. 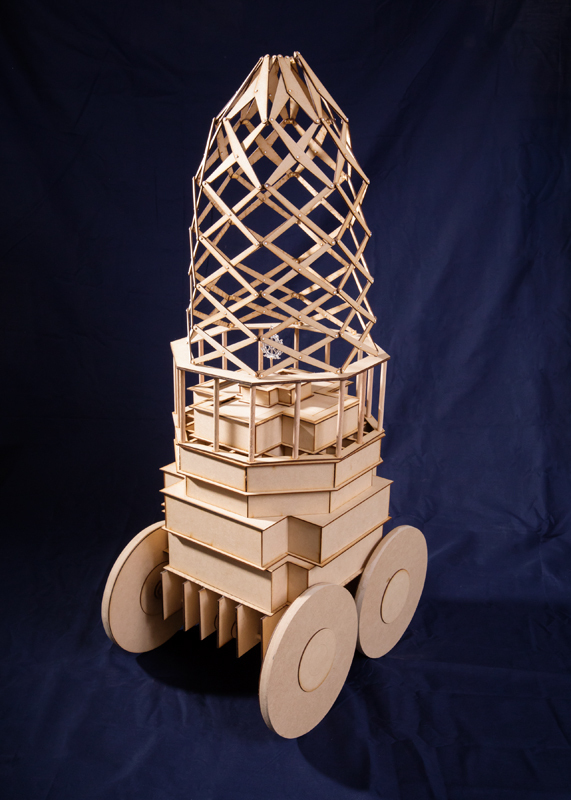 An example of a temple car with a dome that could expand to its full height when in use and collapse for storage. 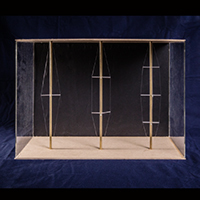 Lightweight structures whose frameworks are moveable could better absorb the forces of a disaster such as an earthquake. Krishnan is working with German Gurfinkel, a professor emeritus of civil engineering, on the stability analysis of columns using prestressed steel cables. Such columns support a significantly larger load while reducing the size of the core columns. A system of prestressed cables and struts can also be used to design a tensegrity dome that is approximately one-tenth the weight of a masonry or concrete dome, Krishnan said. 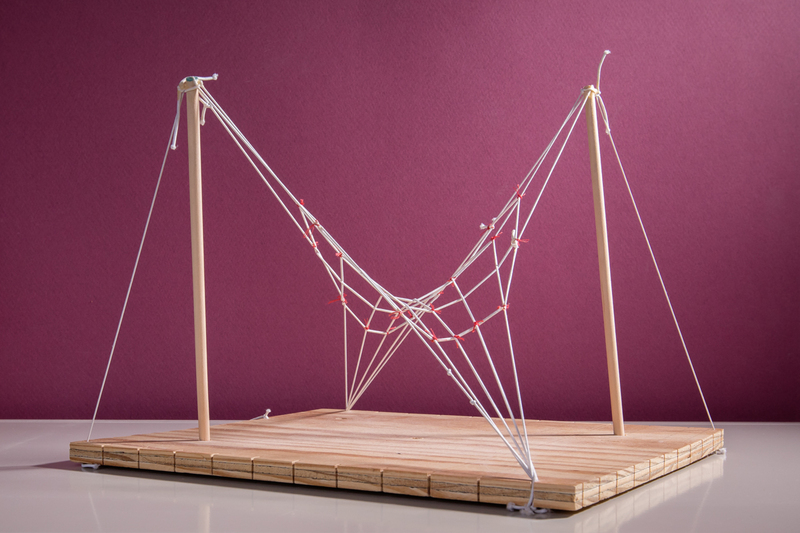 Designing transformable structures is an innovative challenge that requires very precise mathematical calculations. “It’s not as forgiving as designing conventional buildings,” Krishnan said. 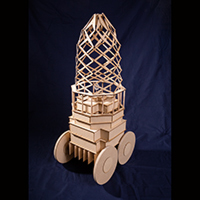 The design requires precise geometry in order to build something that will collapse into minimum volume in order to package it for easy transportation or storage, and then expand to maximum size for use. The joints must operate smoothly so the structure opens and closes reliably and the parts don’t collide. Finally, the structure must be stable and support loads at all states of deployment. 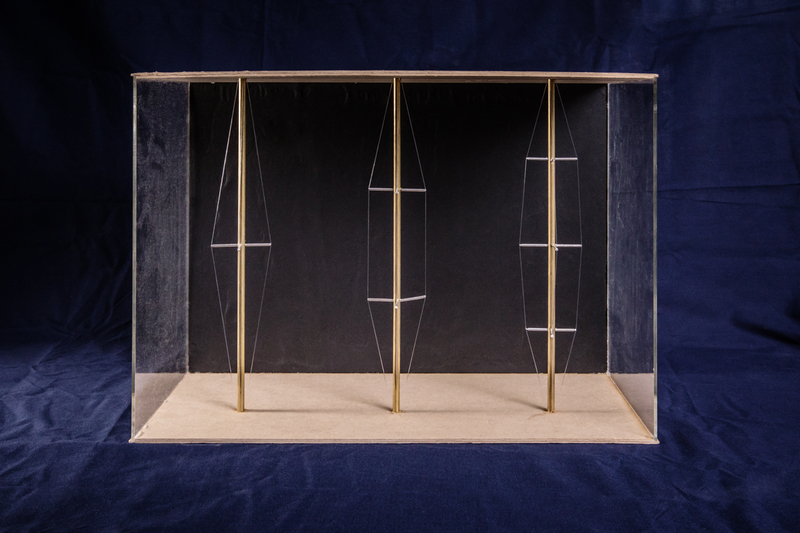 This model of a cable-net structure has a grid of prestressed cables forming a surface of opposing curvatures by cables connecting to the ground and cables connected at the top of the posts. Krishnan taught an architecture course on transformable structures in spring 2017, and he sees it as an area that is ideal for the kind of interdisciplinary research projects that will be offered at the new Siebel Center for Design. “This is a field that really needs architects, engineers and mathematicians. It can benefit from biologists who know how systems in nature move, from material scientists for lighter materials, from industrial designers for design of useful everyday objects and from computer scientists who can write algorithms to automate designs,” Krishnan said. Editor’s notes: To contact Sudarshan Krishnan, email skrishnn@illinois.edu.